You can tell I have turtles on the brain. The third turtle post in 2 weeks. It’s high summer, and the height of turtle season. It’s too hot to do much else. Nothing to be hunted and my boat isn’t ready for the water yet. If you’d like to see my post on trapping and processing turtle, you can find it here. So in the turtle series this week I finally figured out a turtle sauce picante I like. I’ve tried it twice before and just didn’t like it that much. They were edible but, lacked something I was looking for. Both were loosely based off of other recipes, one a Youtube video here. The other was Hank Shaw’s here. They have too much tomato in them for my palate. I think it might be the difference from the Cajun style to my Chesapeake style of cooking. I’m not sure if you go light on tomato it’s can still be called a salsa piquante. But that’s what I’m still calling it. 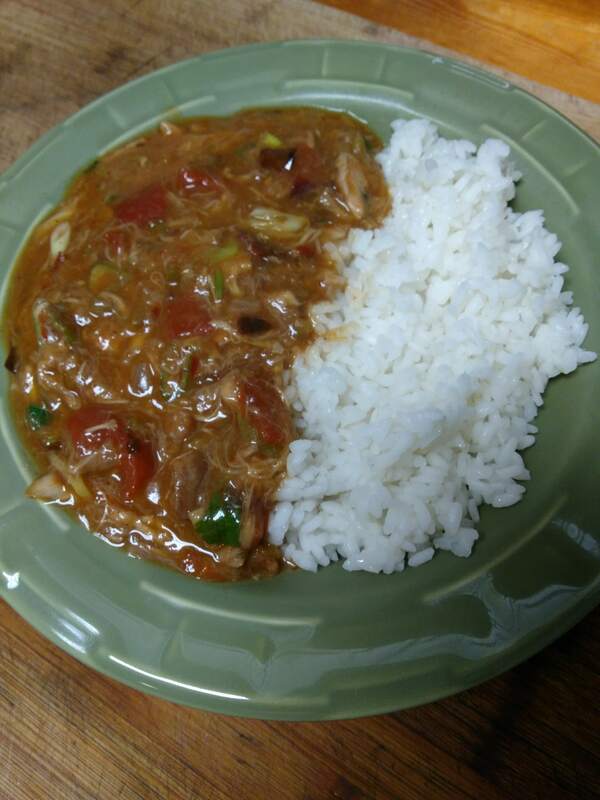 This recipe is based off of Emeril Lagasse’s, alligator sauce picante which you can find here. It’s chicken stock based with tomatoes, instead of tomato base, with more tomatoes. My version has dried chiles in it. It gives it more complexity. I love using dried chiles. I had real Chipotles I smoked myself last year. And those mofros are hot. This salsa was bordering too hot, so be careful with the heat, it can creep up on you. Also, same thing goes for salt. When you are using chicken stock with sodium, cajun seasoning with sodium, and then add more sodium you may find it is too salty to be edible. So don’t add any salt until after you have it close to done. You may find like I did it didn’t need any more. I like to quarter my turtles and then freeze. Fresh, I use the same way. I put them in a crock pot and cover with chicken stock. I then pick the meat when it falls from the bones. I find it’s more time efficient to quarter without deboning. I also find it’s more time efficient to stick it in the crock pot and let it do the work. I then pick the meat like I do with squirrel or even pulled pork. I also like the benefit of using almost every shred of meat, where deboning is inevitably going to leave some behind. If you crock pot it, this can be assembled in 30 minutes. Let the vegetables get soft and then add the meat. This could be an easy weeknight meal if you turn the turtle on in the morning. I think it probably takes about 6 hours for it to get good and tender. Right before you ladle it out, throw in two chopped scallions and good handful of chopped Cilantro. Good stuff right there.